In the small town of Leh in the Ladakh region, high in the Himalayan mountains, nine undergraduate students enrolled in a summer course on culture and communication in India are working with local schools to improve students’ English literacy. 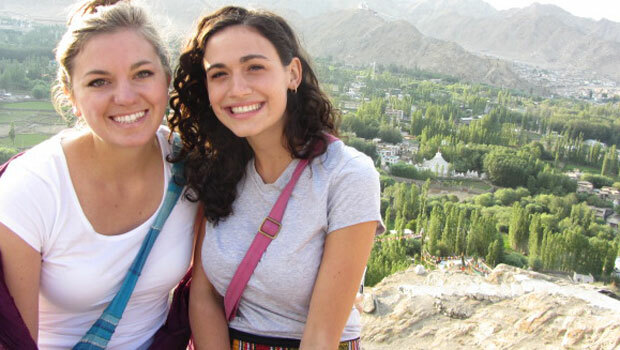 Recent Wake Forest graduates Kendall Hack (’11) and Carrie Stokes (’12) developed the capstone service component of the study abroad course, which is taught by communication professor Ananda Mitra. • Read Kendall Hack’s blog and Carrie Stokes’ blog for dispatches and photos from India 2012. • Visit Ananda Mitra’s travel blog for more information on the study abroad program to India. • See more photos from India. In the rural, isolated region where the students are working, there are major differences between the government-run public education system and expensive private schools, says Stokes. For instance, to move on to higher education, students must pass exams that are administered in English, which many students in Leh struggle to learn. Seeking to address this inequality, the Wake Forest students, including one woman who will officially begin her first year at the University in September, will teach English conversation courses as well as classes on cultural differences to the school children. Hack and Stokes developed the opportunity after two trips to Leh and a combined 10 weeks in India. Stokes explains that on her first trip to India in 2010, the unique, yet disadvantaged, area of Leh both “intrigued” and unsettled her. Hack and Stokes were frustrated by the educational challenges in the region, and Mitra encouraged the women to focus their efforts into a research and service project. “He told us we could do more than complain. We could search for answers and do something,” says Hack. Hack, Stokes, and Rachel Handel (’12), who also participated in the inaugural trip, embarked on a year-long research project that culminated in their return to Leh for five weeks in the summer of 2011, during which they built relationships with instructors and administrators in the district to create the service opportunity taking place this summer. “I just got them to India, and they did the rest,” says Mitra. Hack and Stokes hope this trip will both aid in improving educational success in the region and guarantee the future of the relationship between Wake Forest and Leh. The group will return from their trip in mid August. All Indians are Hindu: India is one of the most religiously diverse areas in the world. In Leh, residents are primarily Buddhist, Muslim and Sikh. Isn’t India crowded and dirty? : Although the infrastructure in many parts of India does not allow for the clean city streets, India is beautiful. One look at the valleys, lowlands and open-air markets will convince visitors. India is homogenous: India is very diverse, with 24 different languages and over 100 local dialects. People identify very strongly with their region, and each region is like a different country.